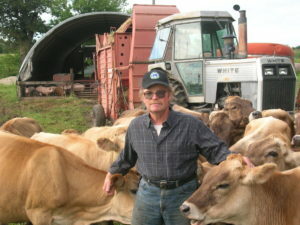 John Gilbert with Gibralter Farms’ herd of brown swiss dairy cows. John and Bev Gilbert farm near Iowa Falls with their daughter Kate, and son John along with his wife, Sarah, and their daughter, Isabel. They grow diversified row crops, raise pastured pigs, and have a herd of Brown Swiss dairy cows. The Gilberts became interested in managing their woodlands to be a profitable part of their farm, and to be better stewards of their land. They enjoy walking through the woods–especially when the wildflowers are blooming. 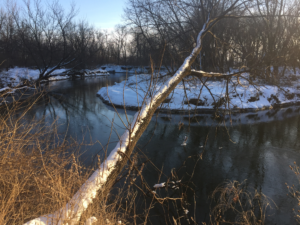 And, as a member of the South Fork Watershed Alliance, the family wants to make sure that their woodlands are working to improve the water quality of the stream that runs through the farm. The South Fork Iowa River, flowing through the Gilberts’ woodlands. To determine their woodland management priorities, the Gilberts’ first step was a Woodland Assessment. This revealed that some portions of their woodland contain valuable wildlife and timber species. 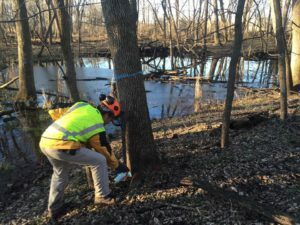 Their bottomland hardwoods (mostly comprised of silver maples and black walnuts) were the priority, and they focused on this area, with a Forest Management Plan and Detailed Forest Inventory. Marking trees for Strategic Tree Selection, to improve the timber and wildlife habitat value of the woodland. 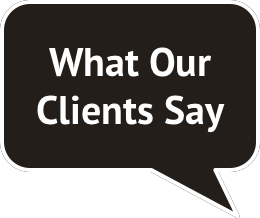 Over the past year, they began implementing their plan with Strategic Tree Selection. This practice will double the rate of growth of the higher value trees, while also improving the wildlife habitat in the woodland. John notes, “We always knew we were lucky to have the woodlands on our farm, but didn’t have the time or knowledge to manage them well”. In making the woodlands a contributing part of the farm, the Gilberts hope it will enable them to invest in other ecosystem improvements. Future plans include restoring three acres of native oak savanna where large bur oaks are growing on a hillside near their home.